Non-smoking apartment for a maximum of 5 people. Approx. 50 sq. m, own entrance, wardrobe, shower/toilet, kitchen with dishwasher, oven, microwave, coffee machine, kettle, fridge/freezer, comfortable dinette, radio/CD player, Flat-TV, one big room with comfortable lounge and double bed, one separate bedroom, sunny balcony with entry to the garden. You’ll find a ski cellar and a ski dryer here. Wifi for free. Our family-orientated and well-appointed house is located in a very sunny and quiet area in the midst of a wonderful garden. The good air and the untapped nature guarantee a great recreational experience. We offer ideal conditions for your vacation which will doubtless meet your expectations. We have got two non-smoking apartments furnished with great attention to detail. You enjoy a gorgeous view to the mountains from the sunny balcony or terrace. You can relax in our new wellness area with infrared sauna, solarium and steam shower. In our gym you can recharge your batteries for the next day. Come - have fun, spoil yourself, draw a deep breath - feel well! 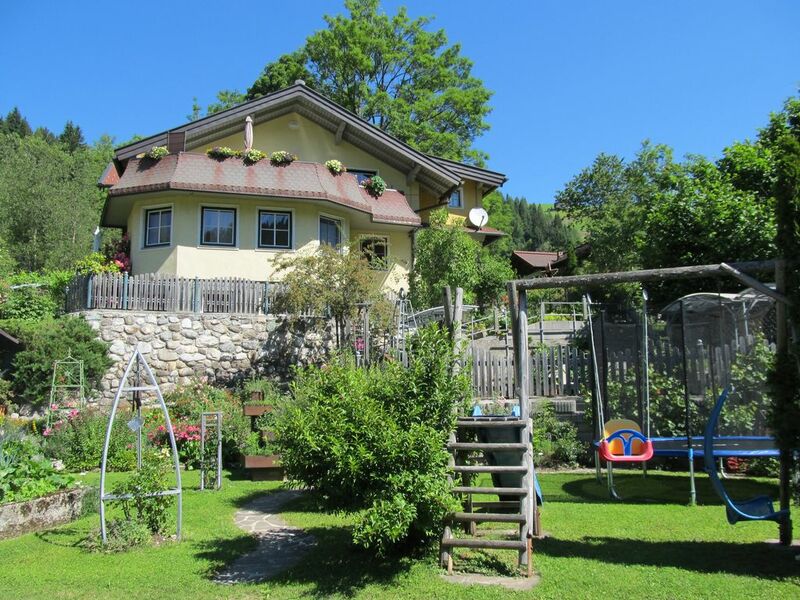 Our house is the perfect place to venture from to see the sights of Salzburg: Visit the city of Salzburg, tour' and see the locations, where the film Sound of Music was shot. Make a journey into the past and visit Hohensalzburg Fortress and also the adventure castles Hohenwerfen and Mauterndorf. Visit a true summer dream of sunlight, water and art in Hellbrunn castle in Salzburg. Experience the largest ice caves in the world. Take a dream ride on Europe’s most famous panorama road 'Großglockner'. The Krimml Waterfalls open the door to a new Wonder-World of Water. Make a journey through the legendary Dürnberg salt mountains. Get unforgettable impressions in a technological world wonder - Kaprun Hochgebirgsstauseen ... Come and see - you are very welcome! Summer in Wagrain: Have fun. Be good to yourself. Take a deep breath. Feel relaxed and among friends. Experience Wagrain with all your senses: the air, the mountains, the beauty of its landscapes. Wagrain is the ideal base for hikes over meadows in bloom and lush Alpine hillsides with clear mountain streams. Take your backpack and lace up your hiking boots. Every step of the way, Wagrain promises unforgettable mountain adventures. Cyclists also get their money’s worth in Wagrain. Explore the surrounding mountains along well posted mountain-bike trails, soaking in those one-of-a-kind panoramic scenes. Shower/toilet equipped with hair-dryer, towels and many racks and cupboards for your needs. In dieser FeWo ist alles vorhanden, die Vermieter sind sehr nett und hilfsbereit. Mit dem Skibus ist man in 15 Minuten an der Gondel. Gerne wieder! Die schönste FEWO die wir je hatten, wirklich "kuschelig", super gemütlich, sehr sauber und mega-liebevoll eingerichtet. Alles vorhanden was man braucht und sich wünscht. Weiterhin eine traumhafte Lage am Rande von Wagrain, mit direktem Einstieg in das Netz der Wanderrouten. Auch ein gemeinsame Grillabend mit unseren Gastgebern und einer weiteren Urlaubsfamilie war super schön. Es war ein sehr schöner Urlaub. Wir kommen gerne wieder. Mooie ruime woning en een knusse (leef)keuken. De tuin is enorm en prima verzorgd met vele kruiden. We komen vaak in Oostenrijk en zijn nog nimmer teleurgesteld in een verblijf,dus de Oostenrijkers weten prima wat gastvrijheid is! Johanna en Wolfgang zijn fantastische gastvrouw/heer met een gezellige BBQ en schnaps avondje en een enorme kennis van de omgeving. Wat enorm handig is als je eens niet de "toeristische"dingetjes wil doen. In der Winterurlaubswoche blieben keine Wünsche offen, außer: der Urlaub hätte länger dauern mögen. Die helle, mit allen Annehmlichkeiten ausgestattete Ferienwohnung und die herzliche Gastfreundlichkeit von Familie Engl trugen zum uneingeschränkten Wohlfühlen ebenso bei wie die traumhaften Möglichkeiten für vielfältige Ski-Aktivitäten. Appartement très fonctionne et très bien entretenu, correspondant bien à la description. Région très jolie : beaucoup d'endroits à visiter. La piscine a été très appréciée. Prévoir 10 euros par lavage, éventuellement des lunettes de voyage si on dort dans le salon et la taxe locale à payer à la fin. N'hésitez pas à consulter le livre de randonnées où toutes les jolies rando sont indiquées (avec des photos en prime). La propriétaire nous a indiqué un resto convivial à côté. Très bon séjour: nous y retournerons volontiers. Appartement très fonctionnel et très bien entretenu, correspondant bien à la description. Région très jolie : beaucoup d'endroits à visiter. La piscine a été très appréciée. Prévoir 10 euros par lavage, éventuellement des lunettes de voyage si on dort dans le salon et la taxe locale à payer à la fin. Wagrain is located in the heart of the Salzburger Sportwelt Amade. It has a population of almost 3.000. Its altitude is about 850 m above sea-level. Wagrain identifies itself with the ski-resort with a charming atmosphere which however also proves to be alluring to hikers and mountaineers in summer. Wagrain can look back at rich history. In the age of the Romans Wagrain was an important junction on the transion-route from North to South. It has also importantly impacted the domains of poetry and music. Every year many people come and visit the tomb of Joseph Mohr, the composer of the world-famous 'Silent Night Song' to which Franz Gruber contributed the lyrics. The central location makes Wagrain an ideal hub from which to take in the region’s natural wonders and cultural highlights. The Mozart-City of Salzburg, Hohenwerfen Castle, Liechtenstein Gorge, Werfen’s giant ice caves are just a few examples of the vast array of possibilities available. Ski: Immerse yourself in a Wagrain skiing adventure! Wind your way down ski runs blanketed in powder, board on pristine deep-snow slopes. Experience for yourself the Amadé Ski Alliance – 760 km of superbly groomed runs and 260 modern lifts, fulfilling the every wish of skiers and boarders alike. If you prefer a more leisurely pace, you will discover winter hiking paths and romantic horse-drawn sleigh rides through the crystal-clear winter air. Wagrain prides itself on being a family-orientated village and has a special place in its heart for the youngsters. With its ideal combination of skiing excitement, winter romance, recreational activities, opportunities for rest and relaxation, and a broad selection of events, Wagrain provides the ultimate winter vacation experience! Guests of our house enjoy free admission to the Waterworld Wagrain. New: free access to the new family & textile sauna! This exclusive sauna area with bio sauna, aroma steam bath, drinking fountain, experience showers and a beautiful fresh air terrace is wellness and relaxation pur for young and old!